Patterned after the OG6G this versatile ruler is excellent for creating and checking halfsquare and quartersquare triangles. 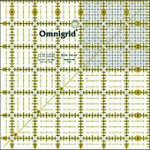 Has a 3" sq, 18" in grid. Sold individually. Packaged 6 per box. Save 5 when you purchase by the box.